Palangkaraya city, Central Kalimantan has Dayak Ngaju Tribe as its original residents. It is the largest city in Indonesia which is called a silent city, because the majority of its residents are as civil servants, private staffs, labors or miners. We can’t see the residents who work as farmers or fishermen here. 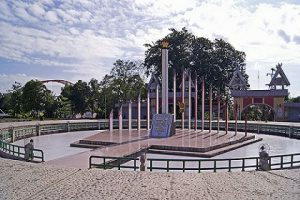 Palangkaraya city which is the capital of Central Kalimantan also has its attractions and recreations for the travelers who want to travel here. 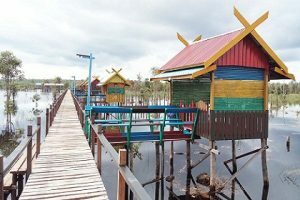 There are some places to visit in Palangkaraya, Central Kalimantan Indonesia. It is a place that you may visit first in Palangkaraya. 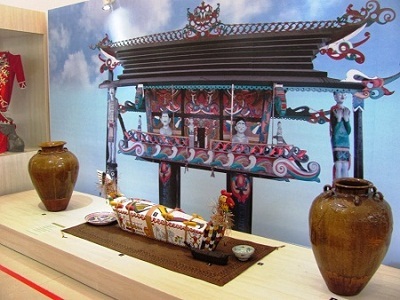 It is a museum which serves you a uniqueness of culture and richness of nature in Palangkaraya. In this museum, there are some collections that are important for you to learn. You can see the various collections and categories, such as, Ethnography, History, Archaeology, Ceramics collection, Numismatics and Heraldic category, and for the last category is Biology and Geology category. Come to Belanga Museum, and you will regret nothing. The museum has complete historical things that can improve your knowledge in History. Indeed, this is the first or many things to do in Palangkaraya, Central Kalimantan Indonesia. 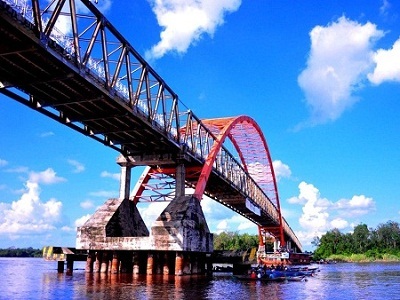 Kahayan is a-640-meters Bridge in length which splits Kahayan River in Palangkaraya, Central Kalimantan. It is as an icon of Palangkaraya. 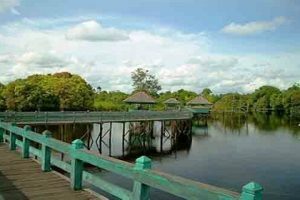 Next things to do in Palangkaraya, Central Kalimantan Indonesia. Kahayan Bridge is used as a main transportation track for the people who live in this city. Although, It has a big water stream, but it won’t cause a flood for the city. The largest and the magnificent bridge in Palangjkaraya is inaugurated by The fifth President of Indonesia Ibu Megawati Soekarno Putri. 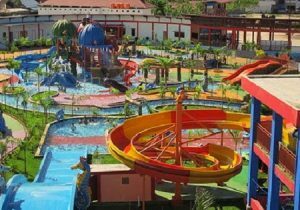 Speaking about waterpark, it is a such colorful waterpark that Palangkaraya has. It is the pool that is appropriate for children and adults to play and swim. 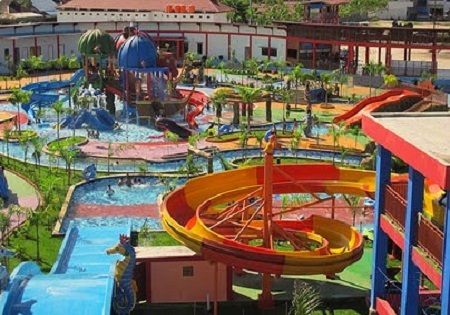 The water park has become a favorite place to visit for Local people since it started to open. It is like a new attractive place considering to water attraction. Bring your family and friends here, you will get many excitement and nice moment. The ticket price is affordable, and if you forget to bring your food. there are a lot of food, snacks and drink stalls available in this waterpark area. Palangkaraya has a charmed nature that you must visit. Specifically, the natural water which is the recreational object for local people and travelers. Kereng Bangkirai Dock is a attractive place for you to see and enjoy natural environment. It is a dock where we can have a peaceful situation. Just come to the Dock, it is a free of charge recreation for you and family. This monument is in the central of Palangkaraya City. It is located in S. Parman Street. It is as a main attraction of Local and international tourists who visit this city. Because of its historical story, the monument becomes magnetism place to visit. So, you do not only know about the attractive tourism place to fulfill your photo album, but also you definitely know about the historical places in every city you visit. The important historical story from this monument is, The first President of Indonesia, Bapak Ir. Soekarno inaugurated the monument in 17 July 1957. And It was officially the Palangkaraya City established. It is a family recreation that is similar to Kereng Bangkirai Dock. It gives an attraction for your children to see the lake and small boat. You can enjoy your food and drinks in a hut that is available in this place. The place is uncommon, because the huts is above the water. So, you can see fish while you are having your lunch. There is no entry ticket, but if you want to rent the hut. Just pay Rp. 10.000. It is a National park that exist in Palangkaraya, Central Kalimantan. It has various flora and fauna who live in this national park. There are about 808 kinds of plants, 15 kinds of mammals, 182 kinds of birds and 54 species of reptiles. The river of this National park is totally black. It is because of the high tannin that this river has. That is the uniqueness of the park! You can go around this park by taking a speedboat. Drive your boat slowly to feel the nature completely. Just rent the speedboat for Rp. 500.00, and you will see clearly what other uniqueness that hasn’t been told. 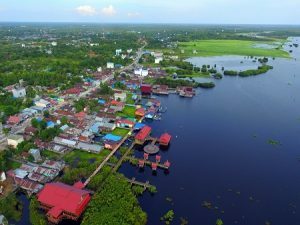 What next things to do in Palangkaraya, Central Kalimantan Indonesia? 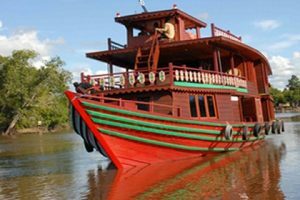 This recreation ship is intended for you who wants to travel around Palangkaraya by using a ship. It doesn’t mean that you will go through every city in Palangkaraya. However, this ship will bring you to an attractive river flow. Find local canoe to rent, it has the same exciting experiences with the ship. you can rent the canoe for Rp. 250.00/hour. It is is one of the beautiful hill that Palangkaraya city has. Tangkiling hill is a good place for you whose hobby is hiking. It is low coast adventure because you do not need any equipment to be brought when you hike to this hill. It is very simple! 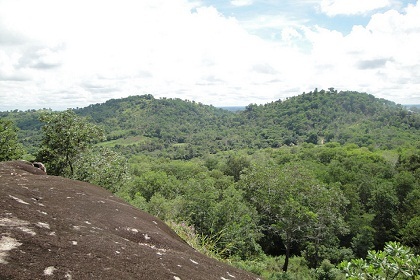 Just bring a bottle of water and your hiking shoes, then you will get the beautiful view from this top of the hill. Don’t forget to bring your camera to take your beautiful moment as well. It is a nice place for relaxing. It show you a tropical characteristic that Indonesia has. The lake is surrounded by trees, and the water of the lake is black, so it will give an exciting natural mystery. This is the place that you must visit in Palangkaraya. the quiet and calm environment make you travel to this city again. Different from Tangkiling hill, this Doa karmel Hill is a hill that is used for whorshiping. It is a religion trip that make your moment memorable. 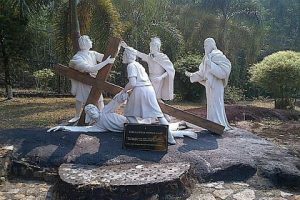 Doa Karmel Hill is a pilgrimage place for Christians, because it has a story that relates to Christians. The silent place and the beautiful decorations will provide you a peaceful and calm situation. Arboretum Nyaru is a forest area that has many fauna and flora species which becomes an interesting place to visit for travelers. 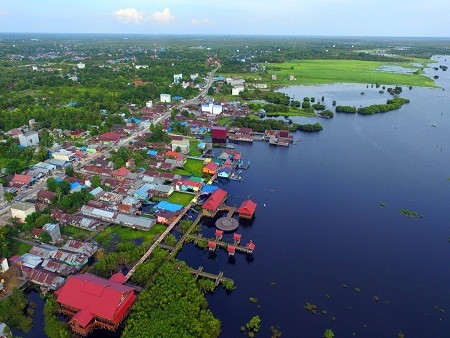 It is located in Tumbang tahay sub-district. It is a conservative forest area that is also used for a research. 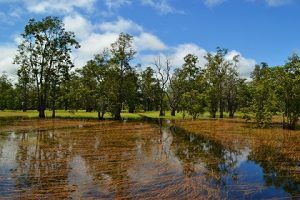 The research relates to plants and animals who live in this swamp forest ecosystem. 13. Borneo Tour – It is a travel agent that will bring you to see the special animal in Palangkaraya, that is Orang utan. 15. 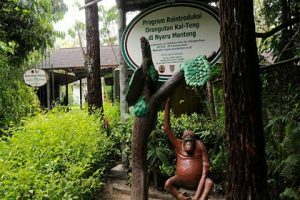 Tangkiling Natural Recreation Park – It serves you a beautiful natural place in Palangkaraya. see the differences with other recreation Park. 16. Rumah Tjilik Riwut, Resto and Gallery – It is not only the delicious local food they serve, but also the nice gallery that you can see. 17. Kampung Lauk – Another best restaurant in Palangkaraya, taste the original local food here. 18. Warung garasi Mbok Ndeso – Culinary is important in every place you visit. It is as a characteristic of its place. try this local food from this restaurant, you will know Palangkaraya characteristics. 19. Fovere Hotel Palangkaraya – need some rest after traveling? you may stay fror some nights in this beautiful hotel in Palangkaraya. 20. Neo Palma Hotel – Another hotel that is suitable for having a rest in Palangkaraya. Ok, guys. Those are the traveling places to visit in Palangkaraya, Central kalimantan. Plus, the best restaurants that serve Palangkaraya local food that you definitely don’t want to miss to taste. And, just find a comfortable hotel for taking a rest in the night. Have a great holiday in Indonesia.